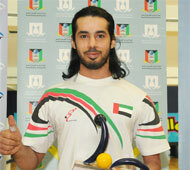 20th March, Kuwait: Hareb Al Mansoori of United Arab Emirates claimed his maiden victory after defeating compatriot Sayed Al Hashemi, 244-205 in the all-UAE finals of the ABF Tour Kuwait 2012 at Cozmo Bowling Center. Hareb, who had earlier routed top seed, Wu Siu Hong of Hong Kong, 211-148 in the first semi-final to advance to the finals while first runner-up, Sayed edged Thailand's Yannaphon Larpapharat, 245-224 in the other semi to face Hareb in the finals. Hareb Al Mansoori started off the finals with a double as his more experienced compatriot failed to match his pace but picking up all his spares. The 36-year-old stepped up with four strikes-in-a-row from frame six to open up a gap of 30 pins. Although Sayed responded with a double in frames eight and nine, it was a bit too late for the 38-year-old Sayed going down 205-244. Hareb, who has been bowling for nine years and have made numerous appearances in the tour, finally nailed his first tour title. The champion defeated fourth seed, Basel Al Anzi of Kuwait, 225-214 in Round 1 before beating Thailand's Badin Lerdpiriyadakulkit, 247-210 in the second round to reach the semi. Sayed eliminated another Kuwaiti, Jassem Darwish 239-228 in Round 1 and then ousted Hong Kong's Wicky Yeung, 206-179 in the second round to make the semi-finals. ABF Tour TOC champion, Wu Siu Hong registered the highest game of the championship when he defeated Indonesia's Ryan Lalisang, 289-270 in Round 2. The top 16 Asian finishers in the preceding 9th Kuwait International Open had qualified for today's single-game knockout finals. 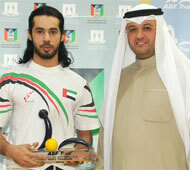 Sheikh Talal M. Al-Sabah, President of Asian Bowling Federation and host, Kuwait Bowling Federation presented the trophy to the champion. The next ABF Tour stop will be in Bangkok, Thailand on April 19. This year's ABF Tour consists of eight legs - four in the Middle East without women division and four in East Asia with women division. Bowlers will earn ranking points from each of the legs they contest and the top 16 men and top 16 women at the end of the final leg, will qualify for the Tournament of Champions. For further information and details, please contact ABF Tour Committee at Tel: +852 2893 6039, Fax: +852 2893 6290; Email: hktbc@netvigator.com. Photos by Terence Yaw in Kuwait.